by Chris Woodford. Last updated: July 1, 2018. Humans can be pretty contrary at the best of times. When it's cold, we want to warm up; when it's hot, we want to cool down. That's because we're warm-blooded creatures who need to keep our body temperatures more or less constant, at around 37°C (98.6°F), just to survive. Vacuum flasks are a bit like people in this respect: they like to keep things at steady temperatures. If you put hot drinks in them, they keep them hot; if you put cold drinks in them, they keep them cool. They're simple, neat, and effective—but how exactly do they work? 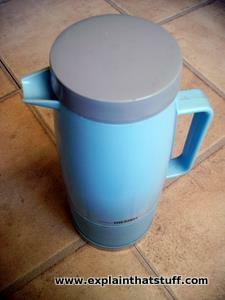 Photo: A typical Thermos® vacuum flask. Vacuum flasks are widely known as "Thermos" flasks for the German company, founded by Reinhold Burger, that commercialized the technology in 1904. 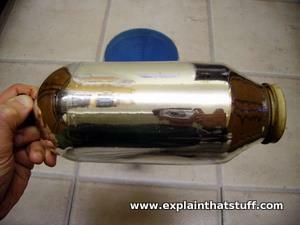 Photo: Scientists also use vacuum flasks, but they tend to call them Dewar flasks or Dewar bottles. That's because the idea was originally conceived in the early 1890s by a Scottish scientist named Sir James Dewar (1842–1923). According to John Rowlinson's biography (see references below), Dewar used his flasks only for keeping laboratory chemicals cold, didn't anticipate the huge commercial market for keeping drinks hot, and consequently never patented the idea! 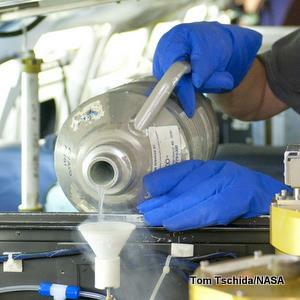 In this photo, a NASA scientist is pouring very cold liquid nitrogen from a Dewar. Photo by Tom Tschida courtesy of NASA. Before we can understand why flasks are so fantastic, we need to understand a bit more about how heat travels. Heat is a kind of energy that moves around our world in three different ways called conduction, convection, and radiation. If you touch something hot, heat flows straight into your body because there's a direct connection between you and the hot object. Heat conduction happens only when things touch. Convection, on the other hand, can happen without the need for direct contact. If you switch on a fan heater, it blows hot air through a grille into your room. Hot air is less dense (lighter, effectively) than cold air so it rises upwards. As hot air starts to climb up from a fan heater, it has to push colder air out of its way. So the cooler air near the ceiling of your room moves back toward the floor to get out of the way. Pretty soon, there's a kind of invisible conveyor belt of warming, rising air and cooling falling air and this gradually warms up the room. When heat moves in this way, using a moving liquid or gas to travel from one place to another, we call it convection. Heating soup in a saucepan is another way of using convection. 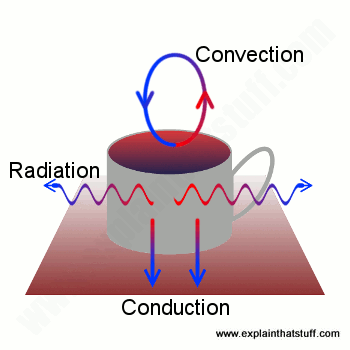 Radiation is slightly different again from conduction and convection. When objects are hot, they give off light. That's why camp fires glow red, orange, and yellow. This happens because the atoms in hot objects become "excited" and unstable when they gain extra heat energy from the fire. Since they're unstable, the atoms quickly return to their normal state—and give off the energy they had as light. (Read more about how and why this happens in our longer article about light.) Sometimes we can see the light that atoms produce and sometimes not. If the light they produce is just a bit too red for our eyes to see, it's called infrared radiation and, rather than seeing it, we feel it as heat. You can feel the infrared given off by hot objects even if you're not touching them (so there's no conduction) and there's no air or liquid present to carry heat either (so there's no convection). Radiation explains why we can feel heat coming from old-style, incandescent lamps even though they're surrounded by glass with a vacuum inside. You can read much more about heat energy in our main article on heat. Artwork: Your coffee cools through a mixture of conduction, convection, and radiation. Suppose you've just made a hot pot of coffee. You'll be well aware that you need to drink it quickly before it goes cold—but why does it go cold? Boiling water has a temperature of 100°C (212°F), while room temperature is more likely to be 15-20°C (60-70°F), depending on the weather and whether you have your heating on. Since the water in your drink is so much hotter than the room, heat flows rapidly from the coffee pot into the surroundings. Some heat will be lost by conduction: because your coffee pot is standing on a table or worktop, heat will flow directly downward and disappear that way. The air directly above and all around the pot will be warmed by it and start moving around, so more heat will be lost by convection. And some heat will also be lost by radiation. Together, conduction, convection, and radiation will turn piping hot coffee into something cold, miserable and yucky in less than an hour. If you want your coffee to stay hot, you need to stop conduction, convection, and radiation from happening. And you can do that by putting your coffee into a vacuum flask. A vacuum flask is a bit like a super-insulated jug. Most versions have an inner chamber and an outer plastic or metal case separated by two layers of glass with a vacuum in between. The glass is usually lined with a reflective metal layer. Unbreakable flasks do away with the glass. Instead, they have two layers of stainless steel with a vacuum and a reflecting layer in between them. There's also a tight, screw-down stopper on the top. Photo: With the stopper removed, you can clearly see the reflective glass inside this (slightly grubby) Thermos flask. Artwork: Thermos flasks were invented by Reinhold Berger and Albert Aschenbrenner, partners in the German glass-blowing company Burger and Aschenbrenner, who formed the Thermos company to market their idea. Here's one of the original US patents that Burger was granted in December 1907. The basic idea has changed little: vacuum flasks still use a double-walled fluid container, with a vacuum between the walls, to stop heat loss. Artwork courtesy of US Patent and Trademark Office. These few, simple features prevent virtually all heat transfer by either conduction, convection, or radiation. The vacuum prevents conduction. 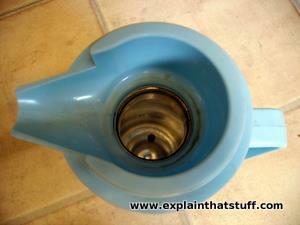 The tight stopper prevents air from entering or leaving the flask, so convection isn't possible either. What about radiation? When infrared radiation tries to leave the hot liquid, the reflective lining of the inner chamber reflects it straight back in again. There's virtually no way heat can escape from a vacuum flask and a hot drink stored inside will stay steaming hot for several hours. Flasks also work for cold drinks. 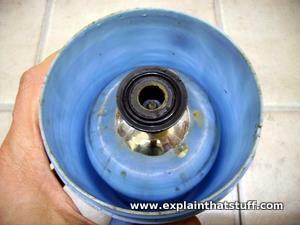 If heat can't escape from a vacuum flask, it follows that heat can't penetrate into a flask from outside either. The sealed stopper stops heat getting in by convection; the vacuum stops conduction, and the metal lining between the outer case and the inner chamber stops heat radiating in either. Whether you like your coffee piping hot or icy cold, vacuum flasks are an absolutely brilliant way to keep your drinks just the way you want. Some heat still escapes (or gets in) eventually, mostly through the stopper, but flasks like this are still a vast improvement on virtually every other kind of insulated drinks container. Outer plastic or stainless steel case. Outer layer of glass coated with reflective material (or stainless steel in unbreakable flasks). Inner layer of glass (or stainless steel in unbreakable flasks). One or more supports keep inner vacuum container in place. Additional insulation reduces heat losses and cushions flask against impacts. Photo: Below: Here's what it looks like in reality. 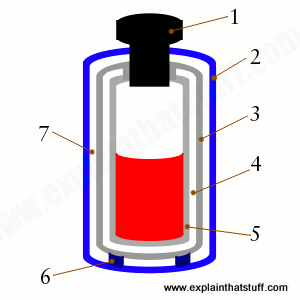 This is the inner vacuum container of our blue Thermos flask, coated with reflective metal, and it corresponds to items 3, 4, and 5 in the diagram up above. The neck of the container (where you pour drinks in and out) is facing to the right and I'm holding the container by its bottom support (item 6 in the diagram above). Photo: Above: Here's the container mounted inside its outer, blue plastic case, looking up from the bottom (with the base of the flask unscrewed). In this flask, the inner vacuum container and the outer plastic container are separated by air (item 7). The black round thing at the top is a single plastic stand that separates the inner and outer containers (item 6). Thermos® Vacuum Insulation Technology: A short (37-second!) video explaining the basic principle of a Thermos flask. US Patent #872,795: Double-walled vessel with a space for a vacuum between the walls by Reinhold Burger (Thermos Bottle Company). One of the original patent descriptions for a double-walled, insulated Thermos flask. The artwork up above comes from this patent. 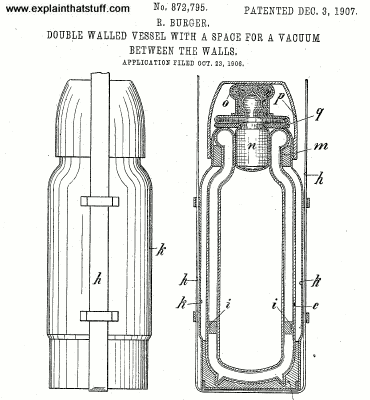 US Patent #912,986: Double-walled vessel by Albert Aschenbrenner. Another early Thermos flask patent filed by Burger's partner. Eyewitness Energy by Jack Challoner and Dan Green. Dorling Kindersley (DK), 2016. This covers the history of how humans have harnessed energy and put it to amazing use. Best suited to ages 9–12. Heat by Darlene Still. Raintree, 2012. A solid introduction to the science of heat—what it is, how it travels, and how it changes things. It includes a few basic activities, a glossary, and some suggestions for further reading. Ages 7–9. Energy by Chris Woodford. Dorling Kindersley (DK), 2007. One of my own books, this introduces the basic concept of energy, different types of energy (potential, kinetic, heat, and so on), and how we make and use energy in our world. Best for ages 9–12. Sir James Dewar, 1842–1923: A Ruthless Chemist by John Rowlinson. Ashgate, 2012. Contains a short account of Dewar's invention and how it was commercially exploited by Burger's Thermos company. This Revolutionary Cooler Could Save Millions of Lives by Liz Stinson. Wired, June 18, 2013. A modified Dewar flask could make it easier to transport vaccines in hot developing countries. Sept. 20, 1842: Dewar's Fortune Is Scotched by John C. Abell. Wired, September 20, 2010. The story of James Dewar, and how he failed to capitalize on his "cool" invention. Modern problems spur changes at Thermos. The New York Times. October 22, 1984. An old (but nevertheless still interesting) article from the Times archive about the growing popularity of steel Thermos flasks and the dwindling demand for a product made obsolete by ubiquitous takeaway coffee shops. Thermos is a registered trademark of Thermos LLC.